By Carl Slaughter: Mike Resnick, in his latest column for Galaxy’s Edge, reminisces about the 1950s science fiction television series Science Fiction Theater. This is significant since Resnick is famous for giving up on television when he started writing award-winning speculative fiction and hasn’t watched an hour of television in 35 years. 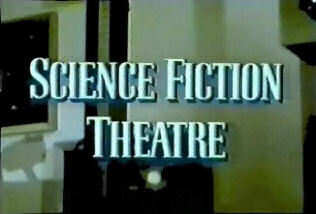 Science Fiction Theater was like a breath of fresh air, because it was clearly of the opinion that there is nothing man wasn’t meant to know or learn. Each of these shows was introduced by Truman Bradley in a state-of-the-art lab (circa 1955) that I would kill to play in. He’d show a couple of related cutting-edge experiments, and then explain that the episode you were about to see extrapolated from the experiments he’d just demonstrated. No stars at all. Well, there were a few stars. The second episode of the first season of Science Fiction Theater, “Time Is Just a Place,” starred Warren Stevens of Forbidden Planet fame. It was an adaptation of a short story, “Such Interesting Neighbors,” by Jack Finney of Invasion of the Body Snatchers fame and Of Missing Persons fame. The main character, played superbly by Stevens, pretends to be an inventor to explain his amazing gadgets. He is from the future and shares with his neighbor a proposed science fiction story. This science fiction story within a science fiction story is the main character’s life story in coded form. The neighbor realizes the implications and plays along, asking questions about the proposed science fiction story to surreptitiously gather information about the future. I also recall an episode entitled “Operation Flypaper” starring the late great speculative fiction actor Vincent Price. Most of these episodes are available on YouTube — here’s a playlist. This entry was posted in Like Show Business and tagged Carl Slaughter, Mike Resnick, Science Fiction Theatre by Mike Glyer. Bookmark the permalink. Bootleg? If you were going to buy bootleg, why not just download it via torrent…? I think there are legit sets of both seasons out there. The show is great, features many episodes based on shorts that had appeared in Astounding not too long before and handled the subject respectfully. @Steve Davidson: Yep, it took me about 5 seconds to find the complete series on DVD on Amazon – it was released in 2015. I barely remember this show, from reruns when I was a kid in the 60s. Apparently, other guest stars (according to Amazon) with SF credits included DeForest Kelley, Basil Rathbone, June Lockhart, Gene Barry, and Marshall Thompson. DeForest Kelley, Basil Rathbone, June Lockhart, Gene Barry, and Marshall Thompson. Barbara Hale, Arthur Franz, Hank Patterson, Gordon Wynn, Magruerite Chapman, Adolphe Menjou, Beverly Garland, Edmund Gwenn, James Westerfield, Paul Birch, Virginia Bruce, Marjorie Bennett, John Doucette, Craig Stevens, Osa Massen, Barney Phillips, James Seay, Rachel Ames, Richard Erdman, Howard Duff, Whit Bissell, Vincent Price, Dabbs Greer,. All from the first season. Names may not be recognizable to some, but the faces will be. The vast majority above have numerous genre call outs, including films like Rocketship XM, When Worlds Collide and more. Yep, it took me about 5 seconds to find the complete series on DVD on Amazon – it was released in 2015. Not only that–I see one of the local library systems here in the Portland area has a copy of the DVD set. Something else to watch once the broadcast networks seasons die down for the summer, and we catch up on the stuff on the DVR. Science Fiction Theater was referenced in Back to the Future because Bob Gale and his late buddy Richard Rosenberg enjoyed laughing at some of its cliche’s when it was syndicated late at night on a local station in St. Louis. And then, in every episode, the camera faded out on Truman Bradley starting to read a copy of Scientific American.